It’s TV Week at GeekTonic and this is the first of several TV-centric articles to help you navigate the mess they call Television. The summer TV season comes to a close this week and we cross over into the traditional, Fall TV season. That means college & pro football is here along with a plentiful serving of TV premieres. I’ve scoured the TV Networks, the web and a few of my own sources to provide you the most comprehensive and accurate listing of TV Premieres for this Fall 2010 season you’ll find anywhere. Subscribe to GeekTonic and you'll get a weekly preview of new TV premieres, finales and specials each Sunday. In that weekly guide you’ll know what’s coming up each week on TV, which ones are aired in HD and you won’t miss a beat when there’s a TV Network change as there always is. As always the “TV for the week” article will be posted each Sunday and will include TV info for eight days: Sunday through the next Monday. New This Year – A Google Calendar with all of the TV Premieres which will be updated throughout the year. The great thing about this is that you can view the premiere times in your timezone and you can add this calendar to your own calendar. 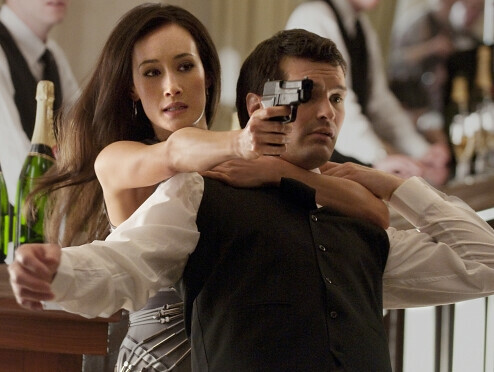 The CW Network brings us the 4th iteration of the Nikita character with their new series called Nikita. It airs Thursdays beginning September 9th. Keep in mind, the TV networks will change their minds throughout the season – even in the first few weeks sometimes. It’s not uncommon to have them change a series the day I post these things and often change things multiple times as well. If I have anything on the list that looks inaccurate please let us know in the comments as I will correct any inaccuracies. The next TV Week Article will be tomorrow where I’ll provide more information about each new TV series along with a video preview link when available. After that I’ll run through the CBC premieres for my Canadian readers and finally a review of the TV schedule by day. 10/3/2010 Sun 9:30PM FOX 6 American Dad! 12/7/2010 Tue 9:00PM WE 1 Mother Knows Best?